Someone help me… I’m on a “raw dessert” bender and I can’t stop! 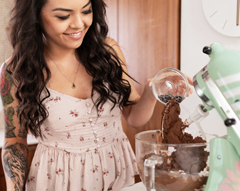 I had so much fun making that Healthy Chocolate Peanut Butter Raw Cheesecake, I wanted to keep the magic happenin’ with that uber creamy, vegan, no-bake life. Last week, I made three raw recipes in one day (now both my fridge and freezer are stocked up. I have enough fudge and cheesecake to last a lifetime, basically). 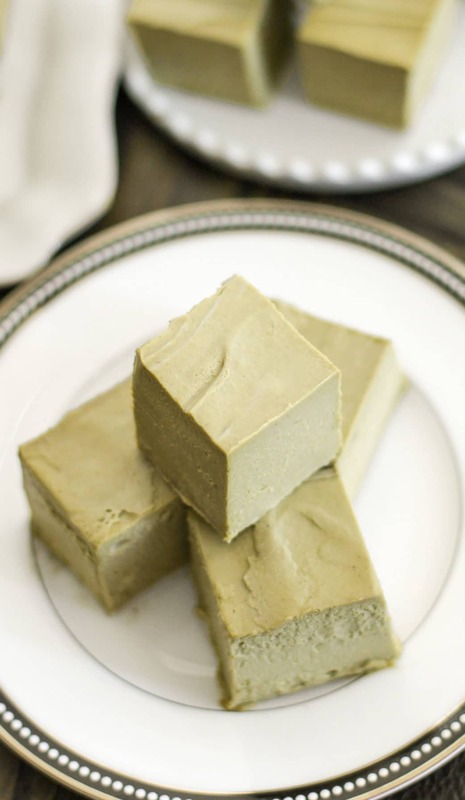 This Healthy Raw Matcha Green Tea Fudge is one of those recipes. Never have I ever eaten anything raw and vegan and dairy free and gluten free and sugar free and low carb that tasted this damn good and creamy and sweet and addictive. It’s not only good tasting, it’s good for you. 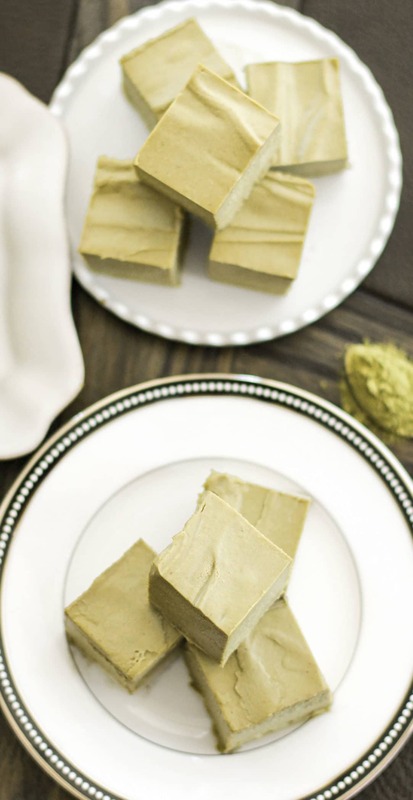 This Healthy Raw Matcha Green Tea Fudge is that good. 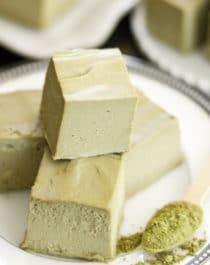 I've never eaten anything raw and vegan and dairy free and gluten free and sugar free and low carb that tasted as good and creamy and sweet and addictive as this Healthy Raw Matcha Green Tea Fudge! In a sealable container, add the cashews, water and almond milk. Cover with a lid and refrigerate overnight. The next day, dump the entire cashew/water/milk mixture into a high-speed blender (I used my Vitamix). Add the vanilla extract, stevia extract and salt. Blend on high speed until completely smooth. Pour in the melted coconut butter and blend again. Add the protein powder and matcha powder and blend one last time. Line an 8x8" brownie pan with parchment paper both ways. Scoop the mixture into the prepared pan and spread it out. Tap the pan on the counter a few times to help get rid of air bubbles. Use an offset spatula if you want to spread out a perfectly flat top. Cover the pan and refrigerate overnight. Slice, serve, and enjoy! Recipe inspired by this Healthy Matcha Green Tea Coconut Fudge. Just. Look. At. That. Texture. Take a minute and really soak in how creamy it is. Oh my gosh, sooooo creamy. I love all of your fudge recipes, I need to get my hands on some matcha! These look like magic in the form of green little creamy squares! OMG, I cannot get enough of how thick and rich they look! do you know of any sort of substitute for protein powder? I cant do any of them but I would so love to try all your fugde and other recipes that have it! Do you think whey protein would work? Found it really difficult to blend the powders in at the end. They just wanted to sit on the top of the previously blended mixture. Was a nightmare to get all the mixture out and clean my vitamix. Enjoyed the fudge but too much work cleaning up for me. Won’t make it again. Sorry you had a difficult time with the blender! You can skip all that by using the tamper (should come with the Vitamix when you buy it). My mixture wasn’t that thick… were any of your ingredients cold? If so, that hardened the coconut butter in the blender, making it difficult to incorporate the powder. I tried this recipe and unfortunately, it did not work for me. It did not set. It was firm enough to cut but the texture was so soft that the pieces did not maintain their shape. I love matcha but I feel the taste could be improved, needs to be sweeter. I would not make this recipe again. Also note that it makes a lot, so it was a waste of ingredients. Sorry! Oh no! Not sure why that could’ve happened! I’ve made this fudge so many times without a problem… did you omit an ingredient or make substitutions? Thanks for the reply! 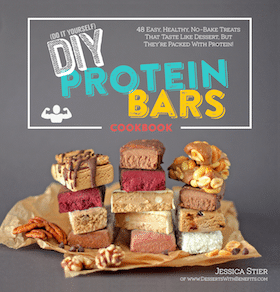 I used all the ingredients, but the protein powder I used was not a rice protein powder. The consistency of the fudge was like pudding, It seems like the longer it is in the fridge, it seems to get a little firmer, but it has been in the fridge for 2 days and is now like a thick pudding. I put a couple of pieces in the freezer to see what would happen, and they got very hard – too hard to bite through. I also had a lot of trouble blending this in my Vitamix blender. The powders just sat on top and did not blend well. I would also say that after more standing time, the taste is better. I’m just not really sure what to do with this recipe to improve it. Thanks for your help. Rice protein powder is a crucial ingredient here. It absorbs a lot of liquid (similar to coconut flour). I’m not sure what protein powder you used, but just FYI, whey protein powder does not substitute for rice protein powder. I would suggest emphasizing the criticality of this ingredient in your recipe and make a statement that it must not be substituted or the recipe will not work. Thank you. Wow your website is amazing! I look forward to going back RAW!! 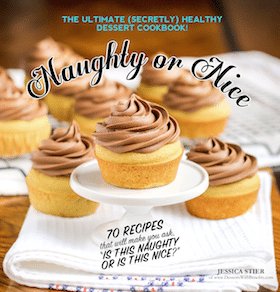 Thanks for recipes that are lower sugar as well. I was burnt out on raw vegan desserts that typically relied on dates exclusively! Hi! Could cashew butter be substituted for the raw cashew mixture?